Your toddler is likely active, curious, and learning new things every day. Intentionally incorporating sensory play into your child’s routine will provide needed development for your little one. Sensory toys are specifically designed to change how a child’s brain reacts to the different senses like touch, sound, movement, and sight. All developing children can benefit from sensory play. Those who develop these types of toys focus on children and their developmental stages and progress. The distinction of sensory toys to other types of toys is the way they specifically help develop, enhance, and also refine a child’s senses. Simply, a sensory play includes any hands-on activity that stimulates your toddler’s senses. As your child explores and creates, a sensory play will support fine and gross motor skills, language development, and social interaction. Sensory development helps children use their senses to gather information and learn. When you select toys for your toddler, include a variety so that they will develop movement, touch, taste, smell, balance, hearing, and sight. Obviously, you want to select age-appropriate toys that are safe and durable. Look for toys with different sounds and music. Choose toys with varying textures like rough and smooth to develop your toddler’s sense of touch. Introduces textures, sounds, colors, shapes, etc. Refines fine motor and gross motor skills. While you can certainly find things around your home to expose your child to his or her different senses, selecting toys specifically designed as sensory toys will further enhance his or her development. We have selected our top ten favorites in hopes of helping you find the right toys for your toddler’s stage, preferences, and growth. Enjoy, learn, and have fun! Most little ones love to play in the water. My three-year-old son could be occupied playing in the sink or tub for hours so he fell in love with his water table the first time he used it. This specific water table features two sides separated by a roadway. One can be used to hold up to ten pounds of sand and the other side can hold up to three gallons of water. Depending on your child’s preferences, you can also choose to use just water or just sand on both sides. Your child can use his imagination to build sand castles and then play with boats and other water toys. The Step2 requires some simple assembly, comes with a plastic cover to get the sand clean and dry, and it is brightly-colored for sensory play. You will likely use this center outside in warmer months. It is sturdy and durable. It should last for plenty of summers for loads of learning and fun. There is just something magical about Thomas the Train. Toddlers love to watch Thomas and to play with all the many different trains represented on the show. With this set, your child can connect multiple train cars with the magnets on either side of the cars. 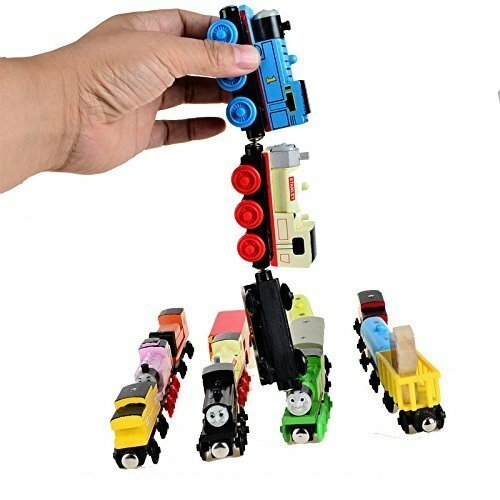 Playing with Thomas trains allows your little one to develop gross motor skills as well as thinking skills as they take the train apart and put it back together. You can also purchase additional train cars to make the whole train longer. You can start off with one engine and one train car to begin your toddler’s collection of a Thomas Train set. Sold separately, you can find wood train tracks that work perfectly with this train set. 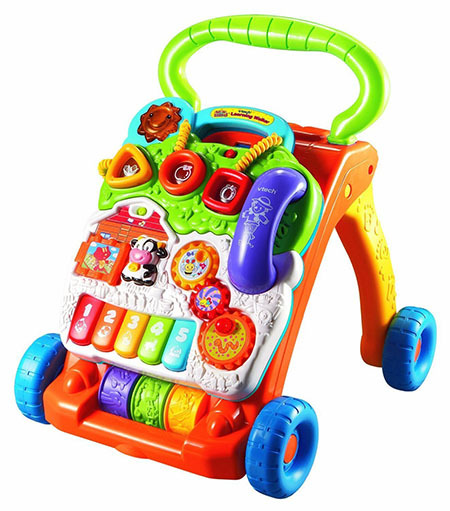 The Sit-to-Stand Learning Walker by VTech is a great toy that helps your baby develop from a crawler to a walker which means it is wonderful for babies starting at around the age of six months. Your baby will love the activity panel for floor play as she develops fine motor skills. It is also sturdy for your little one to learn to pull up on. Your toddler, up to three-years-old, will also love it as a walker. Your toddler can learn everything from colors, animals, shapes, and music. This walker is interactive and fun with its piano keys, light-up shapes, spinning gears, and a telephone handset. Each activity will help stimulate your baby’s learning as well as develop motor skills. There are seventy sing-along songs that will encourage creativity. Your little one will receive a sturdy support as she learns to take her first steps whether on carpeted or hard floors. This walker is very reasonably priced. It is the type of sensory toy that is durable and could be passed from your oldest child to your youngest over time. This colorful play cube is great for your toddler-aged child. It offers six games in one wooden cube. Everything from tic tac toe to counting fish is included. Your child will develop fine motor and sorting skills. Toddlers can also learn their colors, how to count, and their shapes. You will see your toddler develop hand-eye coordination through hands-on activities. This is a great option if you want something for your child that offers learning and play-on-the-go. It is compact enough to bring along on a trip to the store or on a road trip with the family. It is a great way to keep your baby entertained while traveling. It is best for a toddler older than twelve months. Most children feel more secure with a special “lovie” to sleep with a nap and bedtime. This Snoozy is so cozy and huggable. The Snoozy helps reduce bedtime separation anxiety and is a great part of your little one’s bedtime routine. A wrap-around blanket and several special shapes also come with the Snoozy. The shapes are to help your little ones tell stories and to learn to verbally express themselves. The parent guide gives more ideas of how to use each of the included items. It is suggested that this “lovie” only be given to children three-years-old and older due to the small shapes included for storytelling. 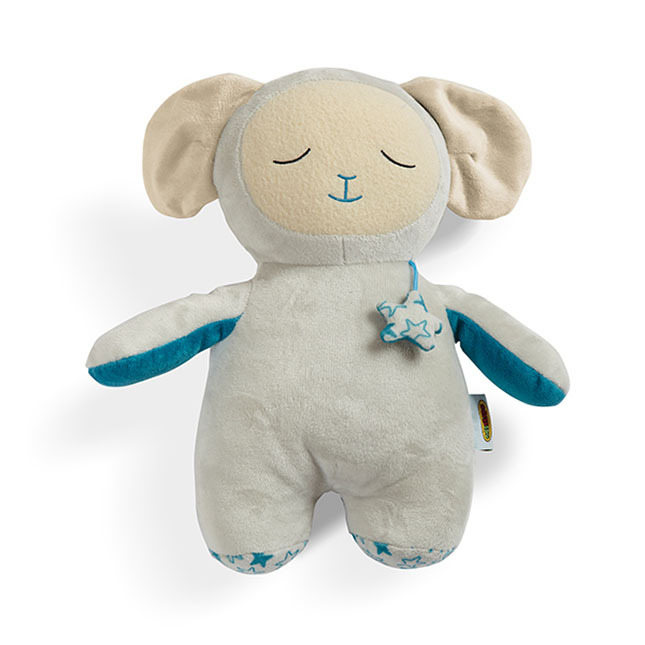 There are so many stuffed animal toys on the market but the Snoozy is unique and may just be what your little one needs to feel more secure and comforted at bedtime. Sometimes a classic activity like Play-Doh is the way to go when you are looking for a sensory activity for your toddler. For generations, toddlers have been squishing Play-Doh through their fingers, pressing it into cookie cutters, and pretending to make pizza. The smell, texture, and colors are familiar and timeless. The same things your brain learned from mashing the dough through your fingers will be what your little one can also learn. 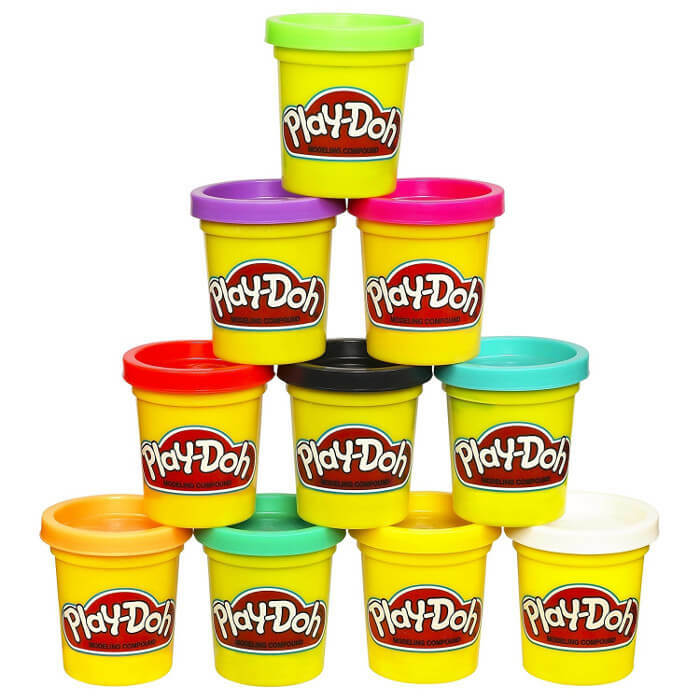 There are endless activities that your toddler can do with just a few containers of Play-Doh. Toddlers will build strength in their hands as they explore and investigate. They will also grow in hand-eye coordination and fine motor skills as they cut, roll, squeeze, and mash the Play-Doh. You can add in activities of all kinds like pretend cooking or a construction car set to build imagination. Play-Doh is also extremely reasonably priced and safe. This inflated, colorful ball is unique with its nubby texture and its ability to glow-in-the-dark. 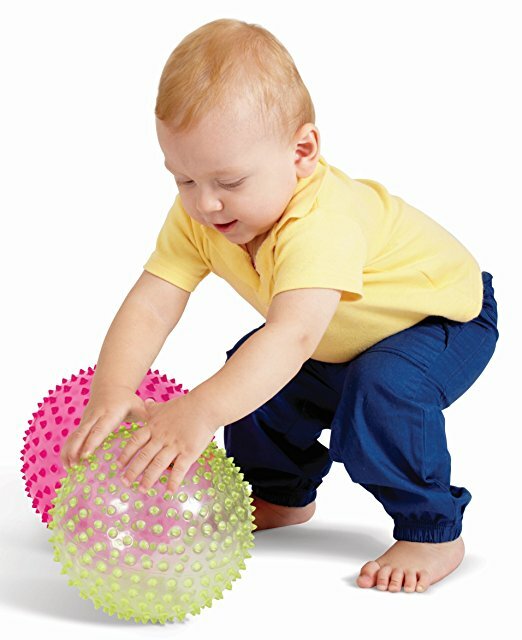 It is so fun for your toddler-aged child to squeeze the ball and feel the rubber stretch and contract. These sensory balls are great fun and have even been used in therapy to calm and relax little ones. It is available in four different colors. With this fun textured ball, your babies, toddlers, and older children will be able to discover, explore, and develop gross motor skills as well as hand-eye coordination. It is made for babies older than six months old. Moms say that their toddlers and their children enjoy playing with this ball together. The unique glow-in-the-dark feature is “charged” by holding it up to a light source for a few seconds. It will glow for quite a while and some moms have even used it as a nightlight for their little ones because it dims slowly as their child falls asleep. You can deflate or inflate the ball as needed. These sensory balls are also effective in massage stimulation. You can softly roll the textured balls on a child’s back for relaxation and sensory awareness. This seven-inch version of the EduShape Sensory ball is also reasonably priced. This large eco-friendly doodle mat is so much fun for your toddler. 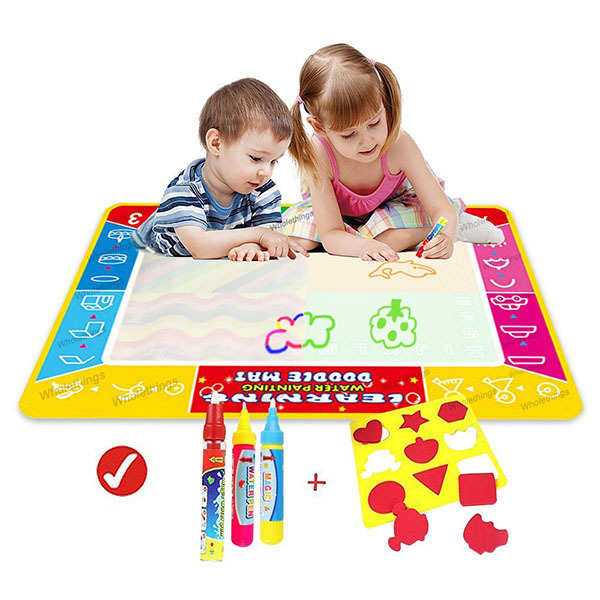 You simply fill the magic pens with water and your children can draw on the mat over and over again. The drawings will slowly disappear after around ten minutes so they can begin again with their imagination. Your little one will grow in drawing, writing, and creativity. The mat is water-resistant and is ideal for children two-years-old and older. To use the mat, you unscrew the head of the pen, fill the pen with water, and allow your child to doodle, write, and draw. Remember that you must soak the mat for forty minutes before you can use the big pen. You can also fold the mat and take it on a trip with your little one. It is compact and easily portable for travel. It will be a fun activity no matter your destination. It is mess-free so you can use it inside or outside. It is recommended that you empty the water pen to prevent leaks and spills while in transit. You can simply refill it after you arrive at your destination. This water mat offers endless play and is reasonably priced. This extra fun activity station is perfect for early learners. The bright colors, bead maze, and turning gears are excellent for developing fine motor skills. You can expect your child to also engage in imaginative play as he learns colors and shapes. There are also animal shapes and wooden train cars to entertain and educate your little one. The beads are particularly exciting for a toddler as they can push and pull them along the winding tracks over and over again. 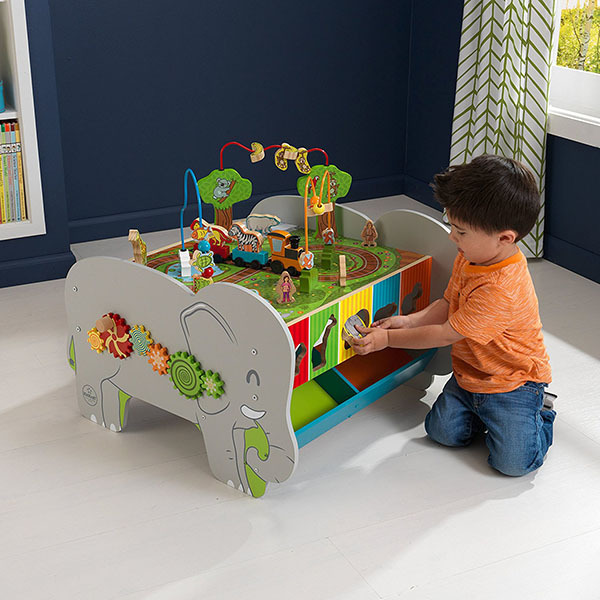 Parents love this activity center for their children because it is well-made, sturdy, colorful, and reasonably priced. It does require a parent to assemble it and it can take around an hour to complete. Once assembled, it weighs approximately twenty-four pounds and measures around 18.4 inches. 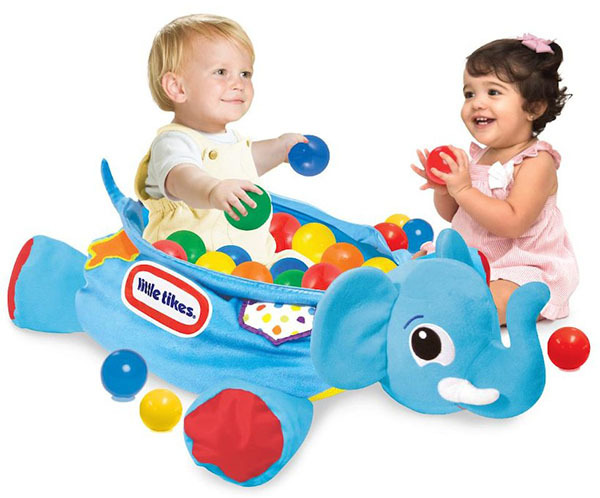 Your toddler is going to love The Little Tikes Sensory Friends Ball Pit. It is so fun and helps little ones refine their fine motor skills. They will sharpen their reasoning skills in a hands-on way as they throw, toss, and collect the balls. You can easily use the bright colors to teach your toddler colors as well shapes. There is endless entertainment possible with this play center. It is made with your toddler in mind. The plastic balls are the perfect size for little, growing hands. The ball pit design is compact and offers an activity that keeps your little one moving. It is made of heavy-duty materials but is intended to be used inside. It weights approximately two and a half pounds. Your purchase includes the ball pit as well as the colorful balls. The wonderful thing about a sensory play is that your toddler will simply be having fun as he develops his brain and gains new needed skills. The selected toys on our top picks list will engage your toddler in a fun and educational way. It is so exciting to see your little one continuously grow and develop. Incorporating sensory toys will only enhance your toddler’s ability to learn at lightning-fast speeds.